There are approximately seven hundred olive varieties, or cultivars, whose distinctive tastes and aromas are developed and marketed, just as viniculture develops distinctive varieties of fine wine. Specialty olive oil producers have mastered the methods whereby they breed, grow, and produce their oil. The highest quality olive oil is produced by painstakingly harvesting the fruit by hand to assure that it is not damaged, even though this method drives up the cost tremendously. Olives for quality oils are picked and milled within hours, to minimize oxidation and enzymatic reactions, which leave unpleasant tastes and odors in the oil and decrease its taste and fragrant qualities. These bouquet oils, like vintage wines, compete among connoisseurs for their taste. These oils are the Rolls-Royce of the olive industry and are sold privately or in gourmet shops, similar to the way one would acquire vintage wines. Olives are almost unique among oil sources in that olive oil can be consumed in its crude form without refining. Almost all other edible oils: soy, canola, corn, cottonseed, peanut, palm, etc. require extensive refining using heat and chemicals to make the oil palatable. Furthermore, unrefined olive oil conserves most of its nutrients, whereas refining often destroys them. What is extra virgin oil, and what is virgin oil? The oil produced by the methods described above is called virgin or cold-press oil. The term cold press can have many meanings, but in common parlance it refers to oil that is extracted without heating the olives or the use of chemicals. However, one should bear in mind that the term "cold press" actually has no legal meaning. Someone selling refined oil as cold press would be violating an industry standard, but cannot be prosecuted for violating the law. It is also important to note that the term virgin oil has no legal meaning in the United States, although there are many countries in the world where the term has a legal meaning. In those countries, someone selling refined olive oil as virgin oil can be prosecuted for violating the law. However, someone selling refined oil as virgin olive oil in the United States is exempt from prosecution, either civil or criminal. There are four categories of virgin oil: extra virgin, virgin, ordinary virgin and virgin lamp oil. The official Italian standard for extra virgin oil is that its taste is excellent and has no defects, and that the oil has an acid content of less than 1%. The lower the acid content, the better the taste. Extra virgin oil is the Cadillac of the olive industry. Virgin oil is not required to meet as high a standard for taste, but still has a positive taste profile, and contains acid content of up to 2%. Never heard of this? There is a reason why – either its taste is considered inferior or its acid content is greater than 2%. These are the Chevies of the olive industry. Usually, this oil undergoes further processing, which is called refining, to remove the excess acid and make it more palatable, and the resulting product should not be called virgin oil, but should be sold as "refined olive oil" or "olive oil" missing the adjective "virgin." Technically, if the oil is exclusively refined olive oil it may not be sold as "olive oil," but if it is a blend of "refined olive oil" and "ordinary virgin" oil it can be called "olive oil." This is the type of olive oil that is used in canned sardines packed in olive oil. In the custom of the world, if someone has bad oil, he kindles it, and his good oil he cooks with. In the ohel moed and the Mikdash, one did not do this. Only the purest oil went for lighting, and the second quality went for the menachos (Midrash Tanchuma, Tetzaveh 6). Olive oil for kindling is usually refined from inferior oil not considered acceptable for human consumption. Is there any halachic problem with use of this oil for kindling Chanukah lights? The earliest source that I found who discusses this issue is the Rashba, in his Toras Habayis (Bayis IV, Shaar I, page 28), the work he wrote, as the title suggests, as a handbook for proper household mitzvah observance. In his discussion about kashrus, he mentions the case where someone discovered a mouse in the oil he had intended to use for food, and whether this oil can now be donated to illuminate a shul. The Rashba compares this to the Talmudic discussion that results from the prophet Malachi’s (1:8) derisive rebuke: “And when they offer a blind animal as an offering, have they perpetrated no evil? And when they offer a lame or sick animal, is this not evil? And if they offered it to their idol, would he accept it or view it favorably?” We see from this verse that it is unacceptable to offer an inferior item in the Beis Hamikdash. The Gemara then derives from this verse that one may not use inferior items for Kiddush or to perform other mitzvos. One should use only quality items for serving Hashem, not items for which one has no other use. The Pri Megadim (Eishel Avraham 154:19) specifically includes the oil one uses for Ner Chanukah under this prohibition. Returning to our mouse in the cooking oil, the Rashba concludes that if the oil is halachically not kosher, one may not use it to illuminate the shul, similar to the prohibition against use of a sick or otherwise inferior animal as a korban. However, if the oil is halachically permitted to eat, such as when the rodent parts can be filtered out, one may kindle this oil in shul. The rationale appears to be that one is not attempting to pawn off inferior items by using them for a sacred purpose, which is the despicable activity that Malachi decried. When one could use the item for oneself, but chose not to, it is appropriate to use it for a mitzvah. Other authorities prohibit lighting shul lamps with this contaminated oil even when it is halachically kosher and one could eat it (Magen Avraham 154:19, quoting several earlier authorities). These authorities contend that serving Hashem with an item that one personally considers disgusting is prohibited. Based on the above discussion, I have heard people say that they use oil that one cannot or would not eat, either because of kashrus concerns or because of health concerns, for Chanukah lights. It is very common to find olive oil sold as “not for human consumption,” or “for kindling only” either because the solvents or other chemicals used to extract or refine the oil are not food grade, because this oil was produced from inferior olives or in a way where the oil tastes bitter, or the oil was not necessarily prepared in the most sanitary environment. Are we indeed required to purchase the far more expensive food-grade olive oil for the menorah? But we may argue that in this case, the oil does not have a disgusting appearance, as opposed to Malachi’s lame and blind animals. The Shulchan Aruch (Orach Chayim 154:12) implies that it is a concern only if the oil appears to be disgusting: If you found a mouse in the oil meant for synagogue use, if it is disgusting, one may not kindle it in the synagogue. In addition, Malachi’s lame and blind animals would be unable to be worked and therefore may have no other suitable use other than being offered as korbanos ­­-– and perhaps this is exactly the prophet’s concern. 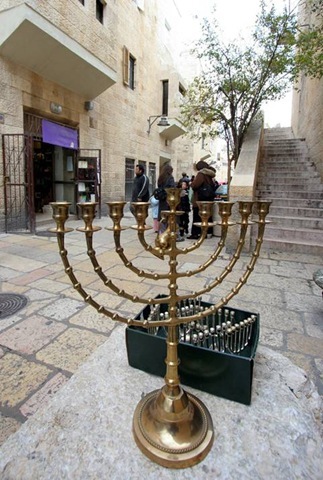 Several authorities permitted kindling Chanukah lights with oil that is too bitter for consumption (Ben Ish Chai, Vayeisheiv 12; Kaf Hachayim 673:11). It seems to this author that our case is comparable to their ruling, and that it is permitted to purchase lamp oil for one’s menorah.